Welcome to DelhiByCycle! A lifetime experience in the streets of Delhi is waiting for you! With our daily tours we invite you to become part of the unique mix of colours, smells, sounds, tastes and unforgettable images. Take the tour and experience the city of Delhi with all your senses! Many, many hours we have spent cycling around, to see and feel what are the best places for you. We offer five fascinating routes, covering the most interesting, intense, historical and beautiful areas of Old and New Delhi! Each of the tours is beautiful and interesting in its own way, with a unique focus, taking you to the hidden wonders of the city! 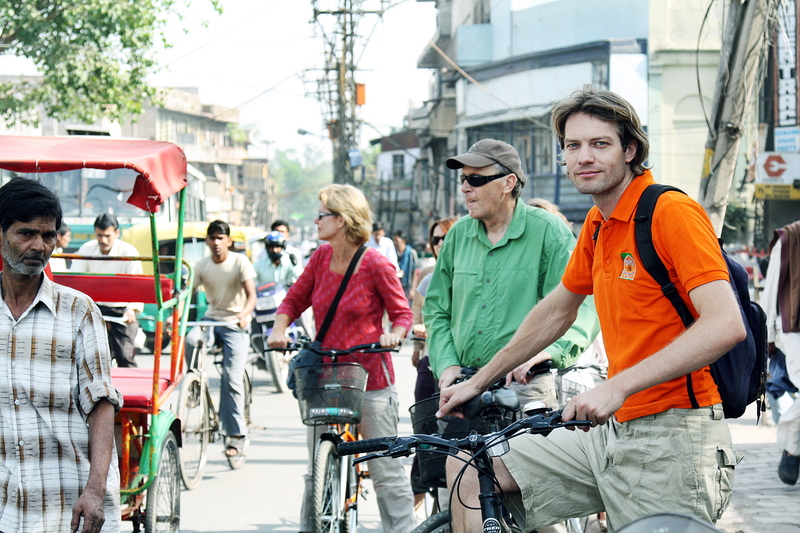 DelhiByCycle is an initiative founded by Dutchman Jack Leenaars in 2009. As the former South Asia correspondent for De Telegraaf Jack started early in the morning on his cycle to discover the back lanes of Delhi. From a couple of participants on his first expeditions, the cycling tours have become a full hit in Delhi’s streets. Unique, green and most important, it’s a project with a soul. Each time Jack is on this bike he gets inspired by the streets of Delhi and can’t stop a bright smile on his face. We choose the most famous movie house in the old city, Delite Cinema, as meeting point. Located at Asaf Ali Road, near the Turkman Gate (for Shah Jahan, Yamuna and Raj tour). Opposite the cinema there is a car parking, walk inside and follow the lane leading inside the parking area. Once you are there, you can’t miss the orange bicycles! From there we cycle straight into the Walled City. We start early! To avoid traffic and crowds the tour meeting time is set at 06.30am and the tour lasts until around 10.00am.